Sankt Gallen Orange Chocolate Stout is part of Sankt Gallen’s Fruit Beer range. 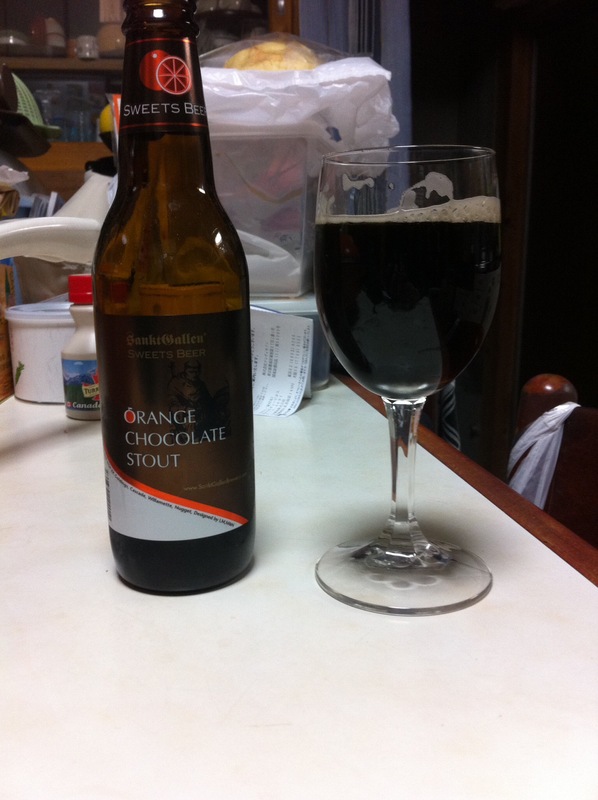 It’s made with whole oranges (peel and all) and chocolate malt. I’m imagining Terry’s Chocolate Orange when I open this. Dip your chocolate orange in some coffee. There’s the Terry’s Chocolate Orange! Christ! I’m quite excited. There’s also a smoky hint to the nose. It’s quite clear, though- you can hold it up to the light and it’s not opaque. Hmm. Not a fan of “thin” stouts. It’s something of a contradiction in terms, don’t you think? The taste is- wow- very bitter. The bottle says that the IBU is a measly 24, but then, the bottle also lists four different kinds of hops in the mix as well (Goldings, Cascade, Willamette and Nugget). WHICH IS IT, BOTTLE? The orange taste in Sankt Gallen Orange Chocolate Stout is very upfront but is trampled war-elephant-like by the bitterness. There’s a lot of coffee, and some cooking chocolate flavour in there- you remember, the stuff your mum told you not to eat because it was for the cake but you did anyway and it was horrible (alternatively, remember that time you tried a chocolate dog treat as a dare? Bleargh). It’s also, surprise surprise, kinda thin. Oh well. After just half a glass of Sankt Gallen Orange Chocolate Stout, this obnoxious flavour was really starting to grate on me. The acidity of the orange and the bitterness of the quadruple hops are trying to one-up each other and just like in Alien Vs Predator, whoever wins, we lose. I struggled through the rest of the bottle and washed my mouth out with a nice refreshing glass of hydrochloric acid and smashed-up thermometers. Aah. Much better. Orange? Yes. Chocolate? Kinda. Stout? NOPE. Sankt Gallen are not impressing me with their fruit beer range. Sankt Gallen Orange Chocolate Stout can be bought from the Sankt Gallen homepage here for a limited time only. Goodbeer has it here, World Beer Market Okadaya has it here, Craftbeers.up here. Le Collier and Nomono also had it in stock at the time of writing. I remember having this a few years ago but didn’t write anything for it. Mainly because the orange and chocolate made me regress into being a child and munching on Terry’s Chocolate orange. And that’s Sankt allen Orange Chocolate Stout down to a tee – rich chocolate and orange flavours with a creamy body to it. The lactose did bring the orange more to the forefront once it had warmed up, and did leave a sticky orange acidic flavour to it that did need to be washed away by something – but not hydrochloric acid.